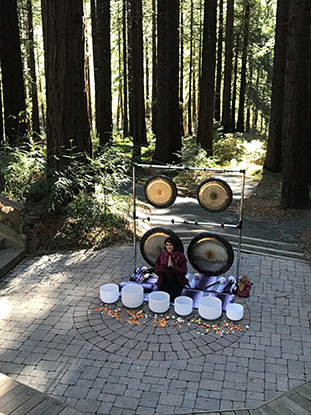 Celebrate the beginning of fall with this special outdoor concert of quartz crystal singing bowls and finely tuned gongs within a grove of redwoods. Close your eyes and experience the natural meditative quality of the forest and bird song layered with serene sounds of quartz crystal singing bowls. No yoga will be practiced, simply wear comfortable clothes and bring layers, blankets, and anything that can make sitting more ease filled. No meditation experience needed. Kids 10+ older may join as long as they can sit still for 60 minutes.